The cover artist for this issue is Hannah Tiernan, who is currently studying art at the National College of Art and Design, Dublin. She works mainly in sculpture, installation and photography. 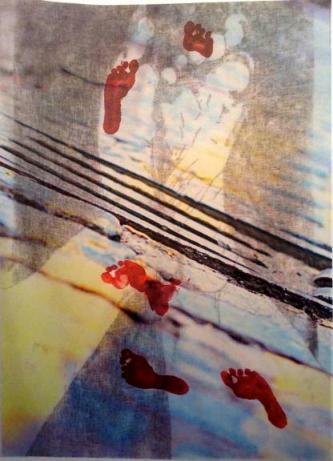 The photograph is part of an installation piece consisting of a large scale mono print on calico. In front hangs a muslin sheet imprinted with footprints and reflecting a projected series of fallen angles. For further information on the project, click on the attached document. More of Hannah Tiernan's work is on show at: https://www.facebook.com/HannahTiernanArtist?ref=stream.